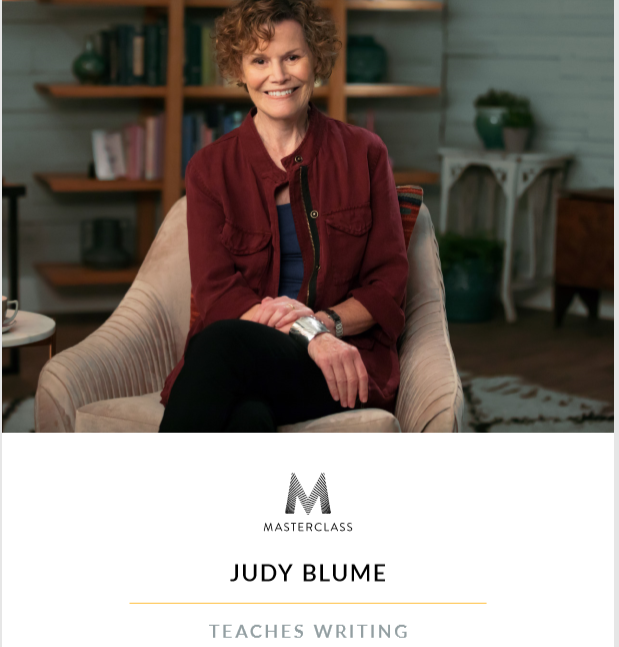 Judy Blume’s approach to teaching you to write is as refreshing as her books are. I genuinely think anyone will enjoy and benefit from taking this writing masterclass. 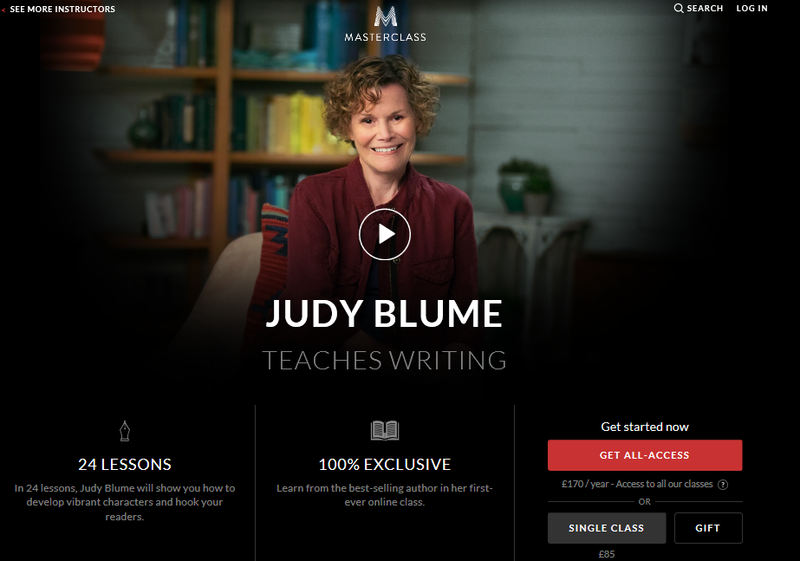 Usually, Judy starts here course by convincing you that you can write. Don’t give up. Don’t listen to anyone who tells you that you can’t write. The person saying that has no idea what’s inside you. As with most things in life, believing you can do something is the first step. So my advice is not to skip the first two videos. They set the scene and get you in the right mindset for the rest of the course. One of the biggest challenges would be writers face is overcoming the fear that they cannot come up with good ideas. Judy helps you to understand that ideas are everywhere. Here are the main sources and techniques Judy uses. Judy explains how to tune in to life so that you can recognize a good idea when you come across one. She then shows you how to record it in a way that you can easily access later. A technique that ensures that you will never run out of inspiration for your books. 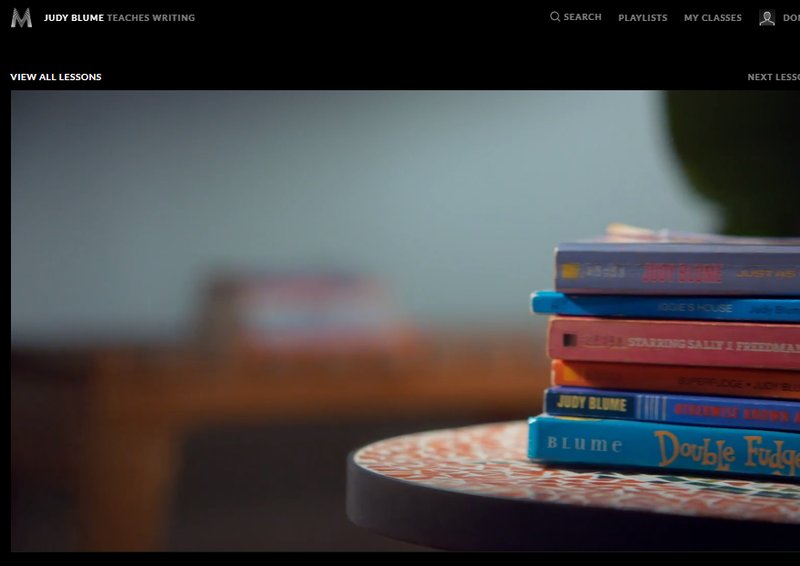 If learning how to come up with ideas for books is something you are particularly interested in, be sure to watch Judy’s “In the Unlikely Event” Case Study. In this video, she explains how one small event unlocked the story for her 4th novel. It is a fascinating tale, that teaches you a huge amount about recognizing and pulling together ideas. It is very clear that Judy is very in touch with the child she once was. If you do not have strong childhood memories, in the way she has, do not worry because you can still write for children. She provides you with several ways to access your earliest memories so that you can tap into them to write for a younger audience. In this section, Judy also starts to explain how to go about covering difficult or controversial subjects. Understanding what you can say about certain issues is not easy. Judy strips things back to the basics and helps you to work out how to stay honest and deal with difficult subjects when writing for kids. She elaborates even more on this subject in video 22 – Controversy and Censorship. Judy also makes some very important points about the difference between adult and child readers. For example, on average, an adult will read a hundred pages before deciding whether they like your writing. With a child, the window of opportunity is much smaller. You have to hook them right away. The only way to learn to write well, for your target audience, is to read. Judy clearly reads a lot and is still learning, even now. So, if you want to write for a young audience, reading a pile of kid’s books is a great starting point. One of the strengths of this course is her case studies. They are truly in-depth. This is refreshing. At the time of writing this review, I had already taken 6 other masterclass writing courses **. Most of them included case studies. But, most of them were not as relevant as the ones Judy provides. **I have been making really good use of my masterclass.com all-access pass. It has enabled me to take 14 of the 50 plus courses that are available, for the price I would have paid for just 2 courses. If you have the cash, my advice would be to dive in and buy the masterclass.com all-access pass, right away. Creating memorable characters is an essential skill for any writer. Judy’s process is very different from the one other writers use. But, it makes a lot of sense and is a method that ensures that your characters become real to both you and your readers. Silly little things like how they brush their teeth or carry a bag helps to bring them alive. Little details create recognition, which in turn creates a connection. That connection can become emotional, which pulls readers in and makes them turn the pages. Judy also explains how to weave emotion into your writing. This along with other little tricks will make your characters more engaging and memorable. The letter tip is pure genius. Any book is about the characters more than the plot or anything else. It is the characters that make the book work. An important part of developing memorable characters is the dialogue you write for them. Getting this right heightens and sharpens them. It makes them leap off the page. There is no doubt that being an active listener will help you with this skill. But, there is more to it than that. Judy explains how dialogue helps you to understand who your characters are and carry the story forward. She shows you how to make everything believable. For example, using real language, letting characters interrupt each other and writing conversations between more than one person all make a huge difference. Writing good dialogue clearly takes practice. Judy once pushed herself to write an entire book without using the word said. It was a way to force herself to use language differently and come up with alternative words. Something you need to do when you are writing as if you are someone else. The playlets tip she shares is a great way to sort out your character’s dialogue. Interestingly, Judy does not use slang much. She is also a grammar rebel, which made me smile and endeared her to me even more. You will need to watch the video to find out why she follows these rules. Also, be sure to complete the case study video for the dialogue section too. Judy repeats herself a little here. But, many of her most important tips and tricks are contained in this video. Also, take a look at the comments. There are some very good additional tips there. Shared by Judy’s students, some of whom who are clearly already experienced writers. It is clear from this section of this writing masterclass that creating a plot is something that Judy does not feel she is good at. The word plot just makes her freeze. Instead, she refers to it as the story she is telling. It is a subtle difference, but she finds that it unfreezes her and enables her to tackle the plot writing process. Her first piece of advice is not to think of yourself writing an entire book. Instead, do things one scene at a time. If you have ever felt overwhelmed by the thought of writing an entire book, this is a great approach to take. It is interesting that Judy still thinks about things in this way and feels a little overwhelmed by the creative process. She also confesses to being a messy writer. After completing this video I realized that there is hope for us all. Judy Blume is not superhuman, she has the same fears and roadblocks as the rest of us to overcome. If you are anything like me, you will have had the experience of reading to the end of a book and being deeply disappointed. You can almost feel the writer giving up and just wanting the writing process to be over. So disappointing. This is definitely not what Judy Blume does. She becomes attached to her characters. For her, ending a book is a sad time. She misses the people she has been writing about. In fact, so much so that she gets quite emotional during this video. However, not so upset that she does not clearly explain how to put together an effective ending, so the reader cannot wait for your next book to be released. Judy is clearly a writer who uses the “write to find out” technique. It is amazing what you can learn simply by sitting down and writing a passage of text. 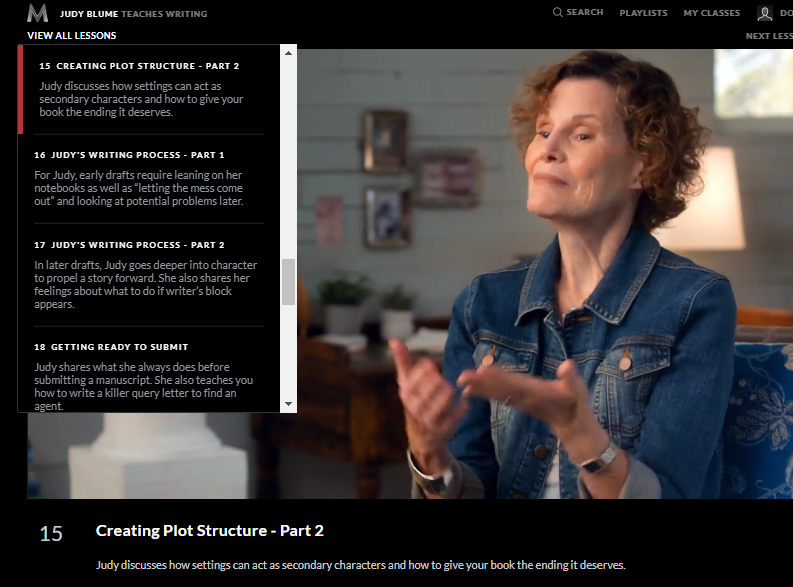 Judy uses this technique to help her to develop her characters and her plot. For example, she is not afraid to write a back story for her characters. Sometimes she uses that material as flashbacks in the book. But, a lot of the time, very little of that text makes it into the final book. She is simply writing to learn more about her character and work out how they will react to the circumstances she has created. Judy’s process is a very interesting one. You might not want to use the exact method and approach she does. What this section of the course does for you is to help you to recognize what you need to be able to write well. The things that get you over the hump, when you are halfway through a book and are feeling bogged down. If you have a messy disorganized mind, don’t let this get in the way of writing a book. Judy is like that, but she has found a process that deals with this way of thinking. A way of gradually bringing order to chaos. A word of warning, Judy does not really cover polishing your book in this section of her course. She does that in a fairly piecemeal way throughout the last half of the course. For example, her tip about reading that last draft out loud does not get shared until video 18 – Getting Ready to Submit. For some reason, actually sitting down to write is tricky. I know that from personal experience. Even after more than a decade of writing content for sites and courses, I still struggle to get started. So, Judy’s advice about how to make the time and find the discipline you need to write is invaluable. She also explains how to follow your life’s rhythms to make sure you can always find the time you need to write. In this section, she also covers how to deal with writer’s block. This section of the course is very important. Getting an insight into how to polish your book and get it in front of the right people is essential. It is something that is not always covered in other writing courses. 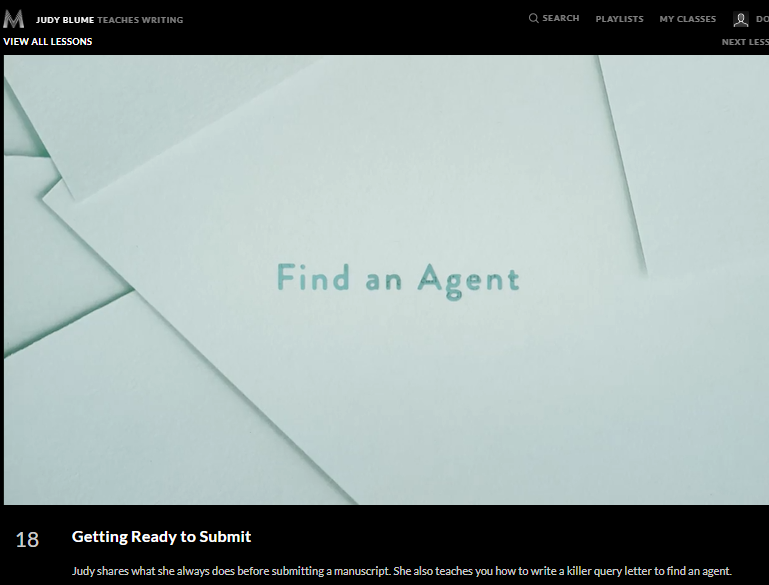 How can a new writer find an agent? Apparently, most publishers are no longer prepared to read through full manuscripts. So, the old way of being discovered is no longer an option. You need an agent. But, finding one is tricky too. At least it would be without the help of someone like Judy. She breaks the whole process down into manageable steps. You need to understand what an editor does, so you are ready for what comes next when someone agrees to publish your book. It is clear that Judy learned a lot from her editor. He made suggestions and she was willing to try things out and appears to have benefited greatly from doing so. It is clear that you need an editor, and it has to be someone you can work with. Judy explains exactly how to find the right person for the job. I was stunned to hear that, even after years of publishing bestsellers, one of her editors rejected a book she wrote. Clearly, this experience felt terrible. But, fairly quickly, she edited it and made it work. That book was a success. One of the many interesting stories Judy shares, which she uses to encourage as well as inform her students. Judy starts this section by saying rejection is a fact of life. You will not succeed as a writer unless you learn to handle negative reviews and being turned down. Again, Judy goes into more depth than most other writing course instructors do. She shows you how to make sure that criticism does not freeze you to the spot. Her biggest lesson is to always look for the positive in the negative. Importantly, she does not just say the words, Judy actually explains how to do this. This is yet another important task nobody else has thought to teach is included in Judy’s course. I particularly like the story of how she came up with the title for “In the Unlikely Event”. The section about creating a cover was fascinating. Completely new information for me and I suspect for you too. 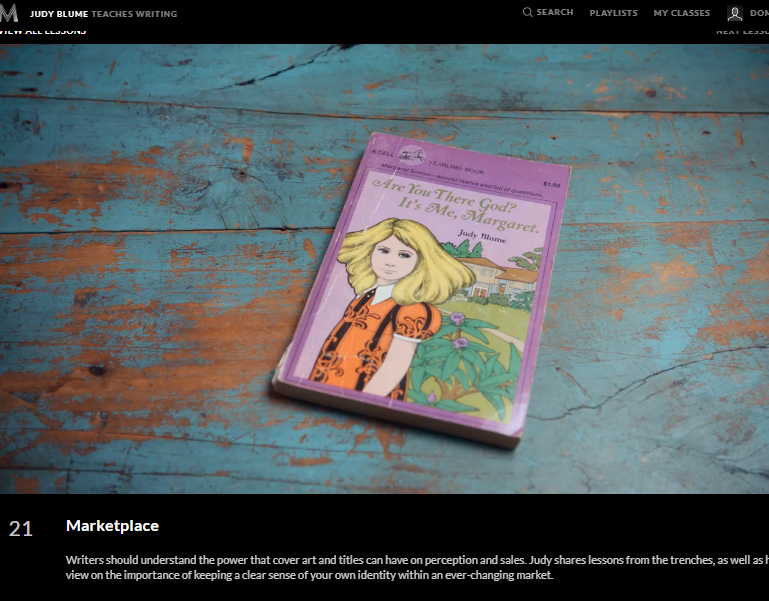 Judy explains how covers evolve to suit each new generation of readers. She also tells us why she accepted a cover which featured Margaret, her main character with blonde hair when in the book she has brown hair. She also shares an important insight that comes from her recent experience as a bookshop owner. 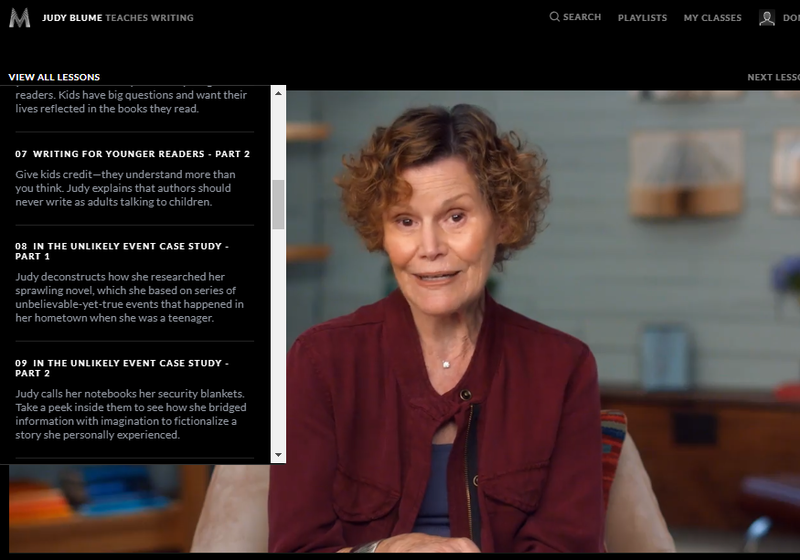 At the time of making this “how to write” course, Judy Blume had not long opened a community run, not for profit, bookstore with her husband. I was stunned to learn that Judy is one of the most banned authors in the USA. Yet, that does not stop her. She strongly believes that authors need to remain honest and true to themselves. Judy has found a way to do that and challenge the censors in a constructive way. One of the best things about the courses you take on masterclass.com is the extra resources. As you can see from my full masterclass.com review, you get far more than a 3 to 6-hour video course when you treat yourself to one of these courses. By far my favorite resource is the workbook. Some I like more than others. Judy’s ticks all of the boxes. She summarises what is in each video. Gives you some extra tips, plus exercises to help you to cement what you learn. So, when you take this course, be sure to download and use it. Is this writing course right for you? I really liked this course. Judy is an engaging and thorough teacher. She does not rely on any of the crutches some of the other instructors seem to use. So, you will be learning every minute of this 23 video course. However, there is one potential drawback. Judy is great at creating fictional characters, but they are all human beings. So, if you want to learn how to create a cartoon, alien or other-worldly characters you will probably need a bit more instruction. If you want to write imaginary out of this world characters you will want to take R. L. Stine’s course as well. On the other hand, Judy covers several subjects that most other authors do not in their courses. For example, finding an editor, choosing a cover, coming up with a title and handling controversy to name but a few. So, my recommendation is to add this course to your “must take” list and consider taking some of the other writer masterclasses too.